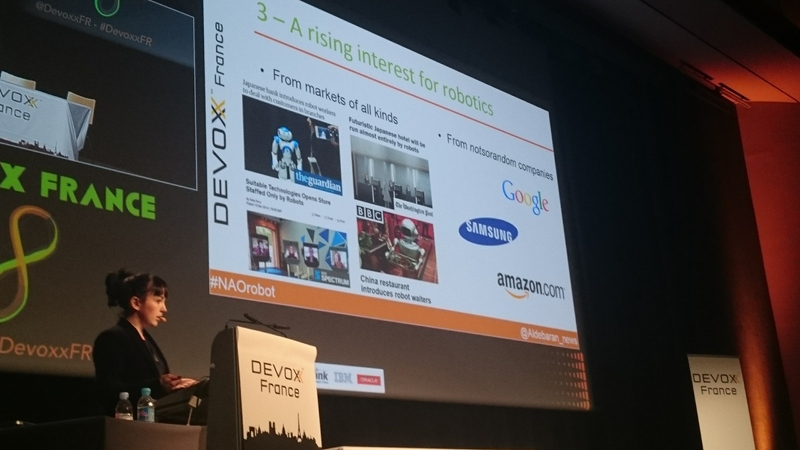 Fri, 17/04/2015 - 14:37 Elise D.
As some of you may know, from April 8th to 10th, Paris’ Palais des Congrès hosted the fourth edition of Devoxx France. During three days, this international event welcomed 2500 persons interested in programming for conferences, meetings and workshops. At Aldebaran, we had the chance to contribute to this with one keynote about the future of robotics, a quick conference explaining why developers should pay attention to robotics and a workshop with NAO. The event lasted from Wednesday to Friday but a new challenge awaited our team at School 42 in Paris on Saturday. 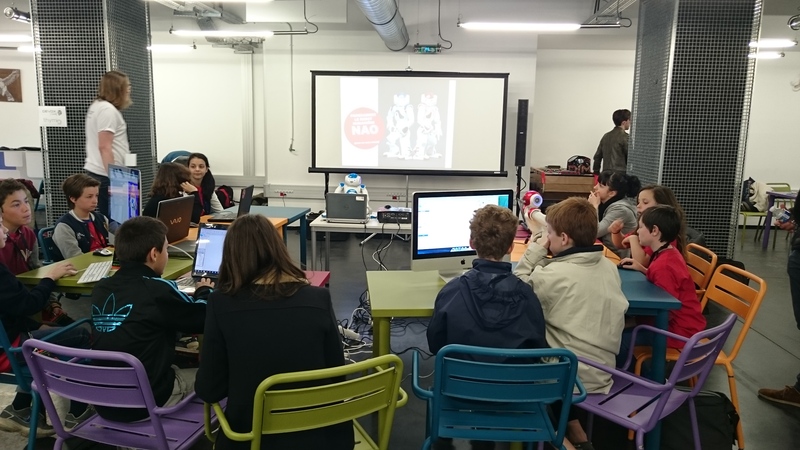 From 10 a.m to 5.30 p.m, fifty budding developers were welcomed to discover and experiment on technologies and tools adapted to kids. 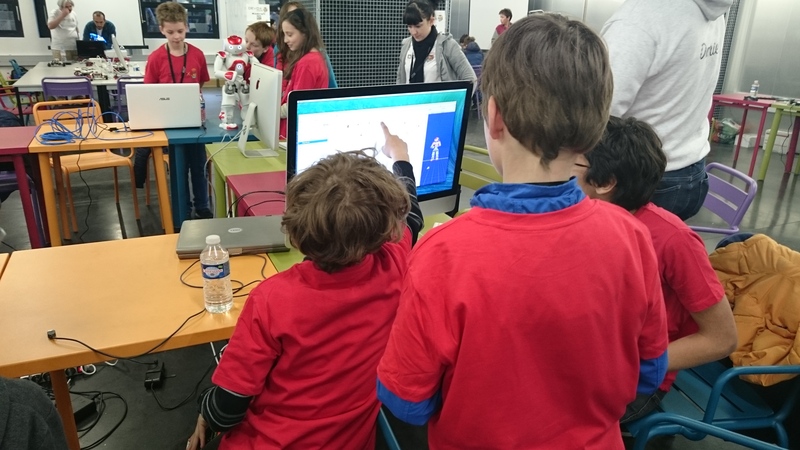 This initiative is part of several events organized worldwide by Devoxx4Kids. Devoxx4Kids started when Devoxx members began to think about a way of getting kids into programming, robotics and engineering while showing them how fun technology could be. They started to organize workshops where instructors would help kids explore, build and play with different technologies (robots, software, computer games, etc). Since 2012, and the first event in Belgium, Devoxx4kids working groups have popped up in many countries and almost 150 events have been hosted around the world. Scratch: a free programming language and online community where you can create your own interactive stories, games, and animations. Just as the adults, Devoxx4kids started with a keynote for kids and parents. At the end of the day, the children had the opportunity to present their work to their families. Emilie and Frédéric from Aldebaran conducted the workshop with three groups during the afternoon. The goal was for the kids to get to know Choregraphe and to make NAO tell a story. First, they explained what Choregraphe is about, how it works with NAO and what the boxes are for. Each kid received a dedicated behavior library to add new boxes for the exercise. The first steps were realized together: setting the language, turning on the motors, making NAO stand up and say “Hello”. Then, they tried their behaviour on the virtual robot to fully understand the connection between the boxes and the robot actions and gestures. Then, the kids added a choice box to make NAO ask if they wanted to listen to his story. They added personalized answers and behaviors depending on the answers the robot would get. After some testing, they were free to continue the story of their choice. Everyone had the opportunity to try his/her story with one of the two real NAO present at the workshop. This workshops was a real success with more than 40 Teens happy and proud of their results. Children understood very quickly the functioning of Choregraphe and NAO. Besides, this kind of exercise rapidly appeals to their imagination which is something they definitely don’t lack. You will find more information on their website. You can also have a look to the pictures of this Saturday here or check the PDF version of our workshop.